Gains in Iraq, over the past several weeks, made by members of the Islamic State of Iraq and Syria (ISIS) have resulted in some news stories concerning their desecration and/or destruction of a variety of historic artifacts (click the above graphic for one example or here or even here and here for the latest). 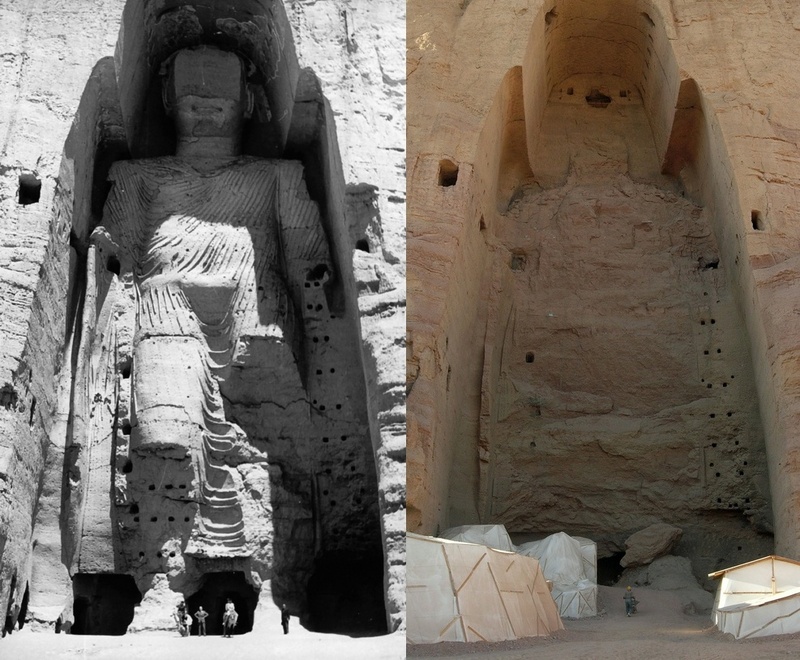 These stories bring to mind the outrage in the media in Europe and North America over the Taliban destroying the large statues of the Buddha carved into the mountains of the Bamiyan province of central Afghanistan, back in March of 2001 (see the below before/after photo, or click the image below for more information). What I find particularly compelling here is the manner in which one view of how identity and the past are related (namely, our own, in which some parts of the past = heritage, to be preserved) is unable to entertain that others may (in fact, do) see things rather differently. For whereas some ancient item may be of inestimable value for one person (say, someone protecting a redwood tree from loggers, or is that not the sort of heritage you had in mind…? ), for another it is hardly of any worth — in fact, it could be just the opposite, in that it’s value may be linked to its complete elimination (think land developers here…, or, again, was this not the sort of desecration of heritage you had in mind…?). Why I find this particular e.g. 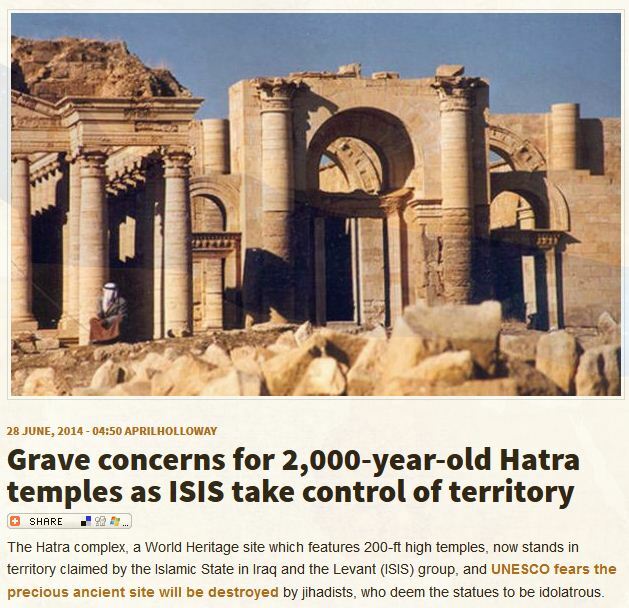 (destroying ancient shrines, statues, etc.) interesting is that so many scholars in the human sciences are now in support of empowering the Other to speak for him/herself, to reclaim their agency in the face of stifling, imperialist scholars who took it away from them, etc., but when these Others step up and claim the “wrong sort of agency” or take themselves a little too seriously — like destroying what we take to be important and priceless artifacts — well…, then they’ve gone just a little too far. For while we want to “take religion seriously,” as the old saying goes, we somehow also know that there’s a right and a wrong religion, and taking your own so seriously that you seek to eliminate all competitors is, well, just downright undemocratic and we won’t stand for it. I hope my point is clear: cases such as those cited above, indicting ISIS, nicely press liberal scholars to come clean on their own interests, interests often undisclosed when it comes to studying the easy cases, i.e., people whom we find to be of no threat to that which we take as commonsense (like which old thing counts as a relic worth preserving). In such cases it is not difficult to call on scholars to empower the Other, respect the agency of the Other, and protect the Other’s own self-representations. But the world is filled with rather more complex examples too, of no less fascinating instances of human behavior, yet all too often scholars are not up to the task of studying these cases in the same manner as when they study things with which they either agree or to which they are attracted in some sort of modern-day Orientalist manner. 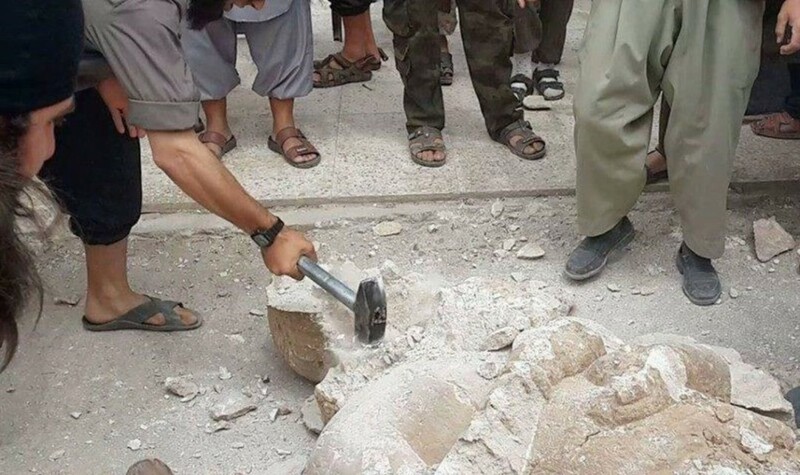 So the question is: How, as a scholar, do you study someone taking a sledgehammer to an ancient Babylonian statue — someone doing nothing more or less than taking their own agency seriously and consistently acting out the worldview we’ve ascribed to them? “Unfortunately,” I then concluded, “or so it is argued by members of luxurious groups, militant dissenters do not play by ‘civil,’ ‘rational,’ or ‘reasonable’ rules. (Religion and the Domestication of Dissent [Equinox/Routledge], 2005). So whose rules prevail — and when? Whose local control of their own environments gets taken over by others by renaming it “world heritage”? As I read your helpful post, I could not help but think of biblical archaeology as an interesting e.g. What exactly are scholars and summer volunteers trying to dig up? 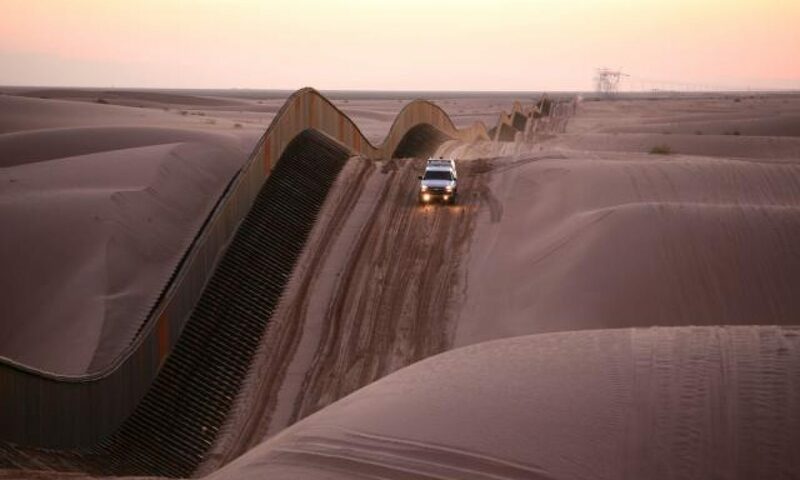 What histories would they rather leave covered? I read a layered juxtaposition here–the archaeologists modeling how to properly and civilly wrestle over history in the land of an Other, all while laying claim to an Other’s land and time. Nice point, Richard: we’re professional and courteous but them…? Those rascals! Also interesting is how more is made of militants destruction of “heritage” than humans. I recall the destruction of the Babri Masjid by Hindutva militants, which was accompanied by rioting that killed several local people. Then, when the “kar sevaks” returned home from working to rebuild a Ram temple on that site, their train cars were attacked and burned in Godhra. This sparked new anti-Muslim riots in Gujarat particularly, leading to the deaths of Muslims there. In all, “heritage” was destroyed and upwards of 2500 people died. These groups of Others took their agency as seriously as anyone else. Were it not for modern media, their acts may have never “occurred” in two senses: the role of media in group’s mobilization and/or remaining subaltern trees falling in a forest unknown to we Western scholars. Archaeologist (RS?) scholars might bemoan this or find it as interesting as Delhi’s Qutb Minar, built from the remains of a Jain temple complex around the time of the Babri Mosque’s construction out of materials from a destroyed “Hindu” temple. Political scientist and sociologist (RS?) scholars would not worry about the “heritage,” but use this as a case for thinking about groups in modernity. Other (RS?) US scholars would not care at all, and choose to focus on vaguely similar domestic events, such as the serious acting out of worldviews by the erection or removal of “10 commandments” from courthouses. Are the latter doing better work as RS-type scholars? I wonder whether your point prior to the heritage question is to have RS-type scholars stay out of Others’ backyards, or those scholars should be doing something else in and among those Others? Previous PostPrevious Yes, You ARE My Data! Next PostNext Isn’t It Ironic…, Don’t You Think?